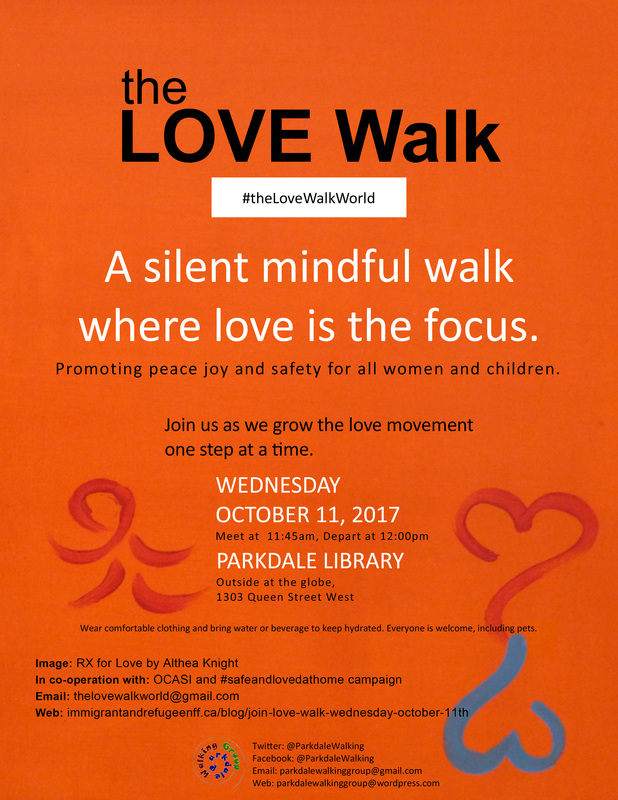 Join The LOVE Walk on Wednesday, October 11th 2017 at 12pm. #theLoveWalkWorld - Let’s make the world safe for all women and children, and everyone! After fully reading the guidelines, we invite you to register to organize and lead a 30, 60 or 90 minute LOVE Walk on October 11th in your community. It can be a walk to a local park, through your neighbourhood, or on a trail. Let us know your city, town and the community you will be walking with! Use The LOVE Walk template flyer and spread the word to your neighbours, families, friends and online. Download and open using Microsoft Windows PowerPoint to personalize the details box. Compatible with Microsoft Windows systems with PowerPoint installed. Download and open using Adobe Acrobat Reader to personalize the details box using a fillable PDF method. Adobe Acrobat Reader is required and is available free at: get.adobe.com/reader. Compatible with Microsoft Windows, Apple, and Android systems. Download. Compatible with all systems. Have a few signs for participants with the LOVE WALK flier on the front and back so bystanders can see in front and behind you why you’re walking in silence, and join in and/or learn more as you complete your walk. Plan the route in advance and meeting place in advance. Let walkers know you will be walking rain or shine. When your walking group is gathered at your meeting place on October 11th, the LOVE Walk leader introduces her/himself to the group. Let them know you will be taking pictures and ask if anyone would like to be excluded from this. Have each walker in the group introduce her/himself as they arrive and if they feel comfortable, share why they are here. Let the walkers know the route they will be walking. don’t pressure her to leave the relationship, but instead provide her with resources so she can make informed choices. Remember that she gets to choose what she does next - control and choice must remain with her. if she wants more information or to talk to a trained counsellor for free, she can call the Assaulted Women’s Helpline, which is a free confidential 24 hour service available in 200 different languages for everyone in Ontario. She can also get referrals there. if she does want to leave, encourage her to make a safety plan, because leaving can be a dangerous time. Share photos of your walk on social media (with participants’ permission of course) using the hashtag #theLoveWalkWorld and remember to send us your favourite photos to thelovewalkworld@gmail.com so we can include it on our Map of The LOVE Walks World. Remember that those living in homes of domestic violence are living with men who are our cousins, brothers, friends, uncles, dads, and sons. The “problem” is not “out there” it is right in our communities and in our families. Let’s say something. Let’s do something. Let’s make the change for a safe and loving world for all women and children, and everyone. Take a few breaths together. Inhaling and exhaling normally, just being aware of your breath as you breathe. If you’re mind begins to wander, know that this is completely “normal”, notice what you are thinking about, and return to the breath. After a few breaths, think about someone or something you love, a friend, family member, pet, spiritual teacher etc. who loves and accepts you just as you are. Feel this love, and let it run through your whole being. (Allow participants a minute or two to do this). Now with a full heart (however that feels for you) extend this LOVE to all women and children who are presently experiencing or have experienced violence. If you have someone specifically woman/women and/or child/children, then you can send this loving feeling directly to them. And as we walk, please return to this idea of love each time your mind wanders, continuing to send love to and for these women and children so that they feel supported as they make changes to leave their situations or make changes even if they decide to stay. N.B. Whomever decides to lead a LOVE Walk, is asked to practice a loving mindset (as best they can) as they gather and lead their walkers together on the day of The LOVE Walk. The LOVE Walk was borne out of The Peer Champion Campaign for The Immigrant and Refugee Friends and Family Campaign. Each peer was to create an event that would promote bystander intervention and raise awareness around gender based violence. Althea’s contribution to this amazing campaign was The LOVE WALK which was borne out of a desire to spread more love, safety, and support for all women and children, and everyone. The 1st LOVE Walk, a silent meditative walk with the focus on love, was held in Parkdale, Toronto on June 10, 2017 starting at the Parkdale Library and ending up by the Lake where Althea then led an art based activity called "The LOVE Wall". The LOVE Walk participants wrote and drew their messages of LOVE, hope, inspiration for all women and children, and everyone on a long sheet of paper. Check out www.parkdalewalkinggroup.wordpress.com for photos. It was so named "The Love Walk Wall" to create an alternate view of a wall outside that of barrier or exclusion. The Love Walk wall, made from paper with uplifting messages of hope, support, and global love was created to share and connect people rather than separate them. With uplifting messages acting as a conduit of peace, love, safety and inclusion for all women, children, and everyone everywhere. The LOVE Walk WALL was hung at the reception desk of the Parkdale LIbrary, where library goers were invited to add additional messages of hope and support for all women and children who have experienced domestic violence and for people everywhere. How you can help spread the message and grow the Love Movement once “the LOVE Walk” is complete? Invite your friends to walk with you or encourage them to lead their own LOVE WALKS. Share your support at #theLoveWalkWorld. You are contributing to a safer world for all women and children, and everyone, everywhere. We thank you for helping us grow the Love Walk World. And as they say in Jamaica, Walk Good!